Ok, guys, I understand that a 15-bar Breville 800ESXL espresso machine looks cool. Any of Breville’s products look cool by the way. Moreover, the stainless steel body helps in this regard. However, let me explain why I’m not a big fan of Breville’s coffeemakers and why I believe that buying their machines is always overpaying. First of all, little historical overview of the brand. Breville is an Australian company that invented sandwich toasters. In addition, for decades their primary products were toasters and small kitchen appliances. However, on one day in 2001, the company was sold to Housewares International Pty Ltd. (now known as Breville Group Limited). And then, marketing and sales guys decided to go global. 17 years ago, they knew nothing about coffee, now the ex-toaster company offers me ‘Purge’ and ‘The Triple Prime Pump’ functions and says that I will have a good espresso on it. Did They Succeed? Let’s Make a Fair Point-to-point Review. 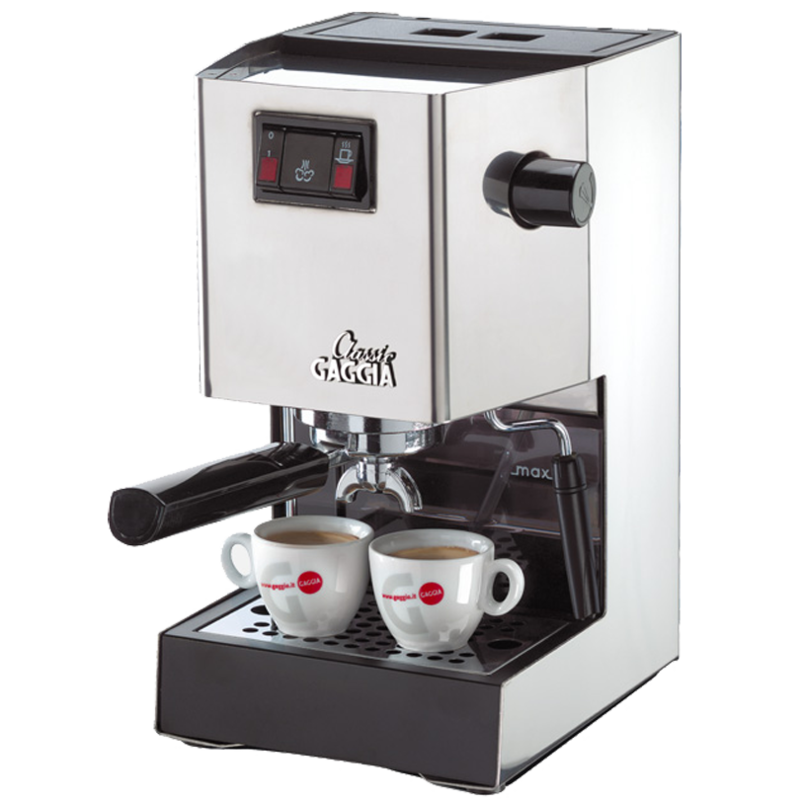 At first, it seems that there is no other coffee machine on the market for this budget that offers so many functions and has a stainless steel coating. 15 Bar Italian Pump. Ok, they use a European-made Ulka pump that almost every coffee maker on this planet has. Nothing special. Purge Function that automatically adjusts water temperature after steam for optimal espresso extraction temperature. Sounds good. But in reality, it’s just means that after you turn off the cappucinatore (milk frother), the water from the thermoblock will flush into the drip tray. After that, new cold water comes to the thermoblock, so machine is ready to serve warm water for espresso. The same could be done with any other espresso machine, just keep the steam open for a while and let the hot water come out. I consider this function quite useless, especially because it leads to over-filling the drip tray more often. But let’s suppose that someone might find it useful. 3 bursts of hot water is released by pump after pre-brewing to moisten the ground coffee resulting in greater build-up to extract the fullest flavor. Again, pre-brewing is nothing I can’t do manually on any other espresso machine, but it could be useful for newbies. Nevertheless, when it comes to that “three bursts” it makes me laught. That is in fact, an absolutely useless musical show that does not affect coffee anyhow. It does affect the pump, however, because it just not designed to work in such mode. So, as you can see now there is nothing special. Ordinary espresso machine with some funny special effects. With that knowledge, we can recheck Amazon now to see what other brands offer in the same budget. Could I offer you one? Look at Gaggia 14101, also called RI9403/11. This legendary model has been around since 1991 with no changes in design. Gaggia is an Italian company that makes coffee machine for decades. Back then, Breville was focused on sandwiches. There are examples of this machine working for 10+ years without losing its functionality and appearance. I could not say that about Breville. Painting around front buttons often peels. Another Breville problem is that it is too complicated ‘under the hood’, which is a direct result of designers being in charge for creating a coffee machine. That does not mean anything bad except well-known problems with a pump (no surprise here considering the fact that Breville’s engineers use a pump to play a musical show), short lifetime of heating element, and that descaling is needed more often for this machine. Nevertheless, let’s go back to Gaggia. The company is based in Italy, the machine is assembled in-house, in Europe. It’s made of stainless steel, has a professional size portafilter (58mm), 3-Way Solenoid Valve and other professional useless-for-amateurs options that really only real barista needs. Why should I buy a Chinese-made Australian-designed espresso maker when I could buy a semi-professional machine, made in Europe by Italian coffee veterans? Another option is new De’Longhi ECP3630. I will write a detailed review of it sometime later. Now, I just want to say that it has the same functionality (except triple prime and autopurge) covered in stainless steel. It is also produced in China by another Italian coffee veteran, and it costs much less. Come on, why should one choose Breville? Or – for the same anount of money – you can choose De’Longhi EC860, that has an automatic milk frother. Some people say that they really need those two functions which I consider useless. They say they need them becuase they are newbies in espresso. I always ask them a question – in that case, why don’t you spend a little bit more more and get a fully automatic Philips Saeco XSmall with a built-in grinder? It’s made in Europe and it will deliver a shot of espresso in one touch with no need no mess with it. As you may have already realized, I don’t like the Breville brand. Nevertheless, I tried to be very objective in this review to show that Breville’s 800 ESXL was not a smart buy. I would understand this choice if the price was two times lower. The machine has no useful extra functions, it’s just an ordinary espresso machine in steel coating. You can buy the same from Delonghi for lower price or semi-professional Gaggia Classic for the same price. Both come from more reputable brands in the coffee world. But let’s be honest. You can love the design of that model just as much as I don’t like that brand. In addition, I understand that looks could be very important. I only want you to know that in case of Breville 800 Duo-Temp you overpay for design, not the functionality. Moreover, it’s a downgrade in terms of reliability. Hi, My espresso machine of 7 years died. Looking at the Breville BES810BSSUSC at about $330. Looking at reviews the durability of Breville seems to be a lot higher than DeLonghi or Gaggia. I had a Gaggia Baby a long time ago and the pump went out rather quickly. Replaced it once and threw it away when it failed again. After reading your Breville review I don’t know what to do. Help?! my breville is going on atleast 7, maybe 10 years without a thing being done to it. I usually pull 3 esspressos a week from it. And often leaving it on so it’s usually hot (which in retrospective I shouldn’t do) but no harm yet :). This is a bunch of crap. You’d be stupid to buy that automatic machine for $100 more. I don’t know anybody that likes expresso that would want a fully automatic espresso machine you take a huge dip in quality of the final product when you go fully automated. I have a Breville Duo temp and this thing freaking rocks. Very consistent shots consistent temperature good Stephen capabilities and very very good looking on the counter compared to a Gaggia which I can’t stand looking at. If someone is choosing an “expresso” machine and the only key factor is a design, then yes, Breville is a number one. Or SMEG. Fully automatic machine for $100 more would be better at least because it has a good burr grinder inside. The decent grinder for this Breville will cost exactly $100 (here is the grinders test). This is true that classic pump espresso machine paired with a good grinder in hands of experienced user will give better results. This is also true that for beginners the result would be better on the automatic machine. 1) If you are a beginner, then super-automatic is more reasonable. 2) If you want to practice your barista skills, then there are many cheaper models with the same functionality as Breville 800ESXL. Or many semi-professional models for such price. And the Gaggia Classic (even the new simplified version) is a good example of better machine for the same money. You may not like its outlook, however there are objective grounds. At least: 1) it has massive brass group head and boiler instead of thermoblock heating system (like on Breville). This gives you much better thermo stability (and durability, by the way). By stable temperature I mean not the temperature of the coffee in your cup, I mean the consistent brewing temperature. It affects the taste and it is usually important for espresso lovers, even critical I would say. 2) 58 mm diameter portafilter. 58mm is a standard professional size, that’s why you can use any professional unpressurized baskets and tampers. To sum up, it’s an ordinary machine, roughly speaking just a simple Mr. Coffee ECMP50 with all its cons, but in the “premium” body. For the price of better machine or more automated machine. Well… I don’t agree at all with this review. I had a Breville Cafe Roma for the last 10 years or so, awesome machine for the price, and still working, nothing failed. I bought the Duo Temp Pro, I wanted to climb a step up in the “Espresso machines world” and it’s a great one. It makes excellent coffee, better than the Cafe Roma, and it’s highly recommended pretty much everywhere excepts here… Several friends have had A LOT of problems with their Saeco machines, especially the automated versions, but even the manual ones. They have it repaired at least once or twice a year. DeLonghi are notorious for their very bad customer service, and their machines have to be repaired very often too, just Google it. Thanks you for your comment, Richard. I may agree with Breville’s good customer service. I believe that in Noth America it’s good. I also never stated that Breville espresso machines make bad espresso, my point was it’s nothing special for the higher price. 1) The engineering is on average level, if not less. Just compare photos of disassembling the Breville 800 here http://word.elysianvisions.com.au/?p=243 and my photos of Poemia vs Delonghi vs Chineese machine here http://101coffeemachines.info/compare/delonghi-vs-saeco-vs-hamilton-beach/ Breville is much closer to the latter. 2) The parts. Breville uses different parts in the different generations of the same machine (for example your new Duo Temp Pro BES810 has many different parts comapred to older Duo Temp 800). Pair it with the fact that Brevilles discontinues supporting old models very soon. Already now you will not find the Thermal Block Assembly (just an example, there are more) for the 800ESXL which we discuss here. Thus it’s very likely to end up with a broken machine in few years with no chance to repair it. Anyway, again, I’m not saying it’s bad, I’m saying it’s not the best choice (IMHO). Because the ESXL800 is in fact an ordinary entry-level machine with the price tag of higher class machines. I don’t want to blame anyone, however I am guessing that at least some of these review sites are written by copywriter freelancers (who saw an espresso machine in real life only in Starbucks). And some other part I suspect never even run test or disassemble it like I’m trying to do here. Other (real) authors could like Breville and it’s their right. However, I assume that the possible reason for placing Breville Duo Temp (I’m not saying now about other models, there are few in Breville’s range that could be worth buying) on the first place of “the best” ratings is money. Being paid a % fee by Amazon they are much more interested in featuring an expansive Breville, rather than cheaper model by othe brand. Breville’s expansive marketing&PR could also play its role. I got this Breville machine at a yard sale for $50 around 7 years ago, and I’m still super happy with it. I upgraded to single wall filters, and the crema and flavor of my espresso are fantastic. Paired with a good quality grinder, the cappuccinos I make at home are better than those of all but the most discriminating of 3d wave coffee shops even with $10,000 commercial espresso machines. Is it a perfect machine? No. But I do think it’s a good value, probably even at full price. I’ve owned two of these machines (marketed in Russia as Bork C800). At first, it worked OK but then it started leaking from around the brewing group. I got the elastic ring changed, which helped somewhat but not for long, as it started leaking big time, resulting in a horrible espresso and badly frothed milk (no wonder, as the pressure must have dropped significantly). Oddly, a friend was moving and offered me to take the identical espresso machine, which I did. Needless to say, after some time the second machine started leaking in the exact same spots. Local Bork service was a joke, as they simply said that by that time the were out of spare parts for this discountinued espresso machine. Now I’m scratching my head whether I should invest in a proper espresso machine or get the thermoblock on this one changed (at a cost of $200). Long story short, if you like the design and have a well-stocked local service center nearby, you can consider this espresso machine. Otherwise, you’ve been warned. Also I wouldn’t discount Australia in terms of coffee. The expectations of the average Australian (not coffee snob) are significantly higher than the average north Amercian coffee snob. I’d suggest this expectation translates into the quality of the coffee these machines make. The classic is just too big for me, I would love to have one but worktop space is at a premium in my kitchen, there are a number of factors that have been missed, the first being that the DTP has a PID that s supposedly keeps the water at a better temperature. The kit comes with a normal steam arm. The cheaper models come with these fancy foaming arms that are great for getting loads of microfoam but useless if you just want to make a flat white; just heating the milk. The DTP also comes with pressurised and unpressurised filters, and handy storage. The DTP is now £234 on Amazon in the UK with a new Gaggia Classic coming in at £210; so think the comparison in respects to price and features is now very slim. j’hésite entre la saeco XS puisqu’il n’y a plus de modèle manuel (aroma ayant disparu…) et la Gaggia Classic? quoi choisir? 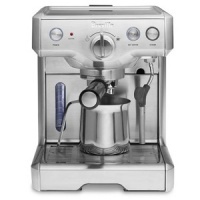 In Canada a Gaggia classic cost 520+tax, the breville duo temp is often on sale under 300. Empty water try slightly more often is minor annoyance for a good purge feature. Comparing that Delonghi 3630 to it is completely out of left field. One of the worst build quality machines around. Hallow plastic buttons and knobs. Might produce some decent coffee now, would seriously question it’s longevity and the reviews indicate the same. Hi! Thank you for this review! Does this also applies to the Breville BES840XL/A? Here in Brazil the market is flooded with crappy capsule based machines. We almost don’t have options for good semi-auto machines that are not imported and with local warranty. The are the chinese clones, the DeLongui EC220CD, or this Breville BES840XL (Sold here as Tramontina Express by Breville). Importing a Gaggia Classic from US (Amazon) makes it as the same price as the BES840XL sold here, almost $863,00… I basically do drip coffee (Kalita Wave), but want to learn to do espresso and cappuccino too. So, based on your knowledge, quality wise, I’m better off importing the Gaggia Classic? Thank you very much for you great job and site. Hi, Edmond! 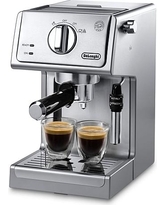 Looked what is sold in Brazil at local Amazon and at Mercadolibre… uff, prices are crazy high, man 🙁 And there is almost no not-chinese semi-automatic espresso machines: only breville and delonghi ec220, as you mentioned + I found Saeco Poemia and Delonghi Dedica on mercadolibre, but with the same crazy high price tag. In my review I was based on price/function and quality ratio, that’s why I wrote that it’s better to buy Gaggia Classic. In your situation may be the local Breville Tramontina would be a good choice. Becuase buying a Gaggia Classic makes sense only if you have/can buy a decent burr coffee grinder… and that’s double the budget :(. However, consider buying a cheap chinese ‘clone’. The most popular one in Brazil is Philco, as I understood. Yes, it’s not so good as Saeco, Gaggia or Delonghi. However it’s almost 10 times cheaper and in such situation it starts to make sense! It could be a good point to start, to practice with the low budget. Thank you for replying! Appreciate it. I was waiting for your answer before making a decision. Thanks! I use an old (20 or 25 year old) “MultiChef” model EX-102, made in Spain to make a little coffee to add to more milk and enjoy that, using a modestly priced burr grinder (“Capuno” model 580 made in China). Does the job but the plastic frame is beginning to break in spots. Still works though. I am more concerned with the quality of the boiler. Don’t want to use aluminum ‘boiler’ but want something more ‘healthy’ – stainless steel or . . . ? There are tooooo many makes and models to review and choose from. Don’t want to spend too much but want a reliable machine. For mine, unscrew the top, add water as desired, put top back, flip the on switch and let water/steam pressure do the rest. Good enough so far for me but maybe it is time to move up. Understood “Breville, e.g. is cheap to repair for example. Usually peruse “Craigslist” for a decent deal. Takes too much time and what to choose. ? Suggestions please ! ! First of all, the machine, which you reffering to (Multichef EC-102), is not a real espresso maker like Breville. It is so called ‘steam espresso machine’ without the pump. ‘Without the pump’ means that the pressure is not enough for real espresso, pressure is generetaed by steam pressure from boilng water – the process is very similar to moka pots. As far as I know all modern model of such type (few examples are: https://amzn.to/2WjVUV2 by Mr. Coffee, https://amzn.to/2U8GPIv by Aicook, https://amzn.to/2CDJuQk by Capresso) are equipped with aluminum boilers. Thus, if you want a 100% stainless steel solution and want to get similar coffee, probably you should consider moka pots made of steel like Bialetti Venus. If you want to switch to real espresso (machines with 15 bar pump), then (among budget models) only Delonghi uses steel boilers. Consider following models for example: http://101coffeemachines.info/delonghi/eco310-311-icona/ or http://101coffeemachines.info/delonghi/bar32/ or http://101coffeemachines.info/delonghi/ec702-ec710/ or http://101coffeemachines.info/delonghi/ecp/ But you will get less hot and more strong coffee on these machines. P. S. Can’t comment the grinder because I can’t find any information about Capuno 580.